With so many makes around, each offering stocks (26-inch) or mods (20-inch) or even 24-inch models, choosing your first bike is not really easy. If you are quite small, the mod (with 20 inch wheels) is usually an easier platform to start with. What are the main differences between stocks and mods? What about 24-inch bikes? 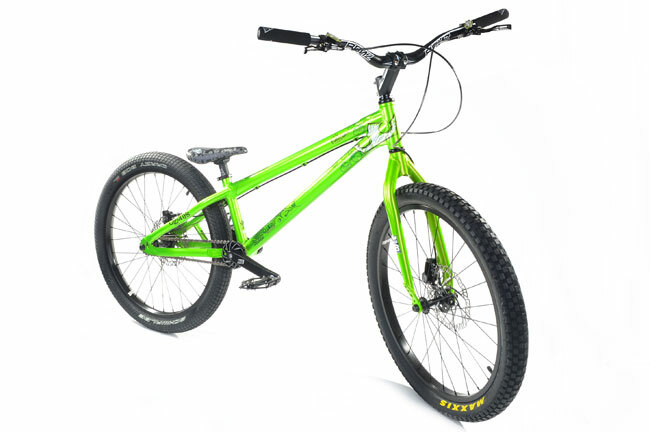 Stock or Mod bikes (26" or 20" wheels)? Also check out the excellent video guides made by Adam himself from TartyBikes, about choosing bike components and assembly tips. Mods are very bouncy. In the early days of biketrials, these were bmx-type 20" size wheeled bikes modified for riding trials (Mods). So they are more reactive and you can maneuver and move your body around without feeling stretched. They are also more sturdy and can take more abuse (because of the integrated bashguard, the single-speed design with no rear-mech to trash, the smaller and stronger frame, stronger wheels...) Also, as a starter bike, a Mod is probably more rewarding. The very short chainstay makes it very easy to hop and balance on the rear wheel. They are easier to sidehop with, even if it is to land randomly on the bash plate. They are lighter than stock bikes and tend to cost less too. 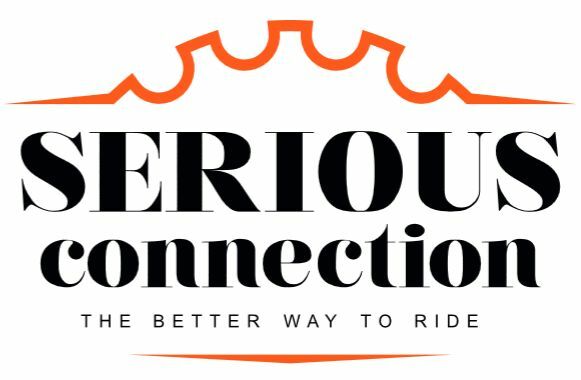 They have no other use than riding trials (the very small gear ratio means you can't really use it to commute anywhere, like you could with a BMX), but they take less room if you are short of storage space. 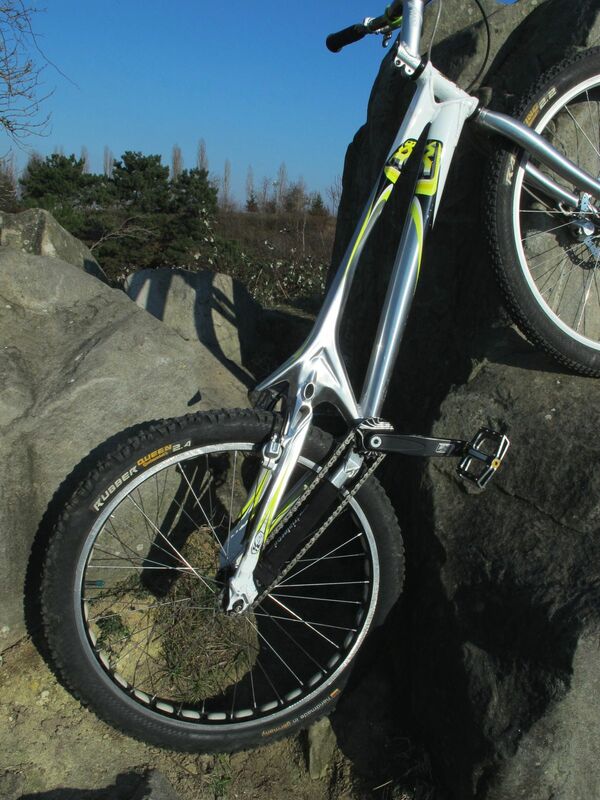 The stock bikes in comparison were 26" wheeled mountain bikes optimised or customised for trials. This meant riding on a small frame geometry, lowering the seat, taking out one or two outer rings and adding a chainring protection. You could still use it for riding in the woods. This was the old-school approach. You can still start a few moves of trials on a regular mountain bike, but you will soon find some limitations due to frame geometries. The new generation of stock trials bikes have geometries so specific to trials that you can't really use them for anything else. They come with reinforced and shorter chainstays, sturdier tubing and they will last you much longer than a regular mountain bike, at least in a zone. The new geometries can look a bit odd, but you can still buy most of the spare parts in a regular bike shop, and they will make a huge difference to ride trials (especially to balance on the rear wheel). They allow to fit much larger tyres up to 2.5" wide, and most frames don't even have a seat option. If you are tall, you can ride indifferently a stock or a Mod bike, and it is really down to personal preference. With the 26" wheels, the stock bikes roll more easily, giving a smoother riding experience. Also, the longer frame means you have more reach with the front wheel, when bridging over a gap, or for most techniques landing on the front wheel. 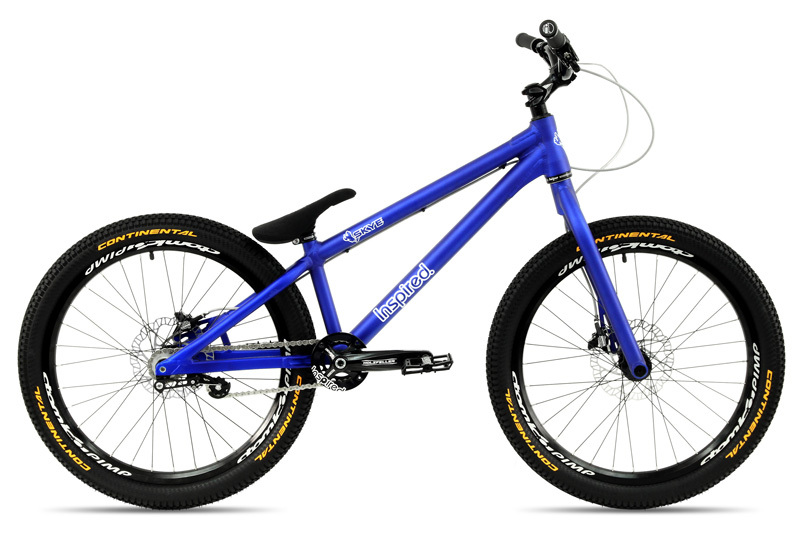 The cool thing about stock bikes is that they can look more like ordinary mountain bikes (especially if you have a frame that can take a seat) and passers-by won't confuse your stock bike with a BMX. If you run several speeds, then you can commute to your favourite riding spot much faster than with a Mod. Now what with 24" bikes? That's the new trend, the optimum mix for street trials. Some champions, equally at ease on Mod or Stock bikes argue that 24" trials bikes would bring the best of two worlds together. More reach than a Mod bike for front-wheel moves and hooking techniques, and more manoeuvrability than 26" Stock bikes while being stronger and lighter. 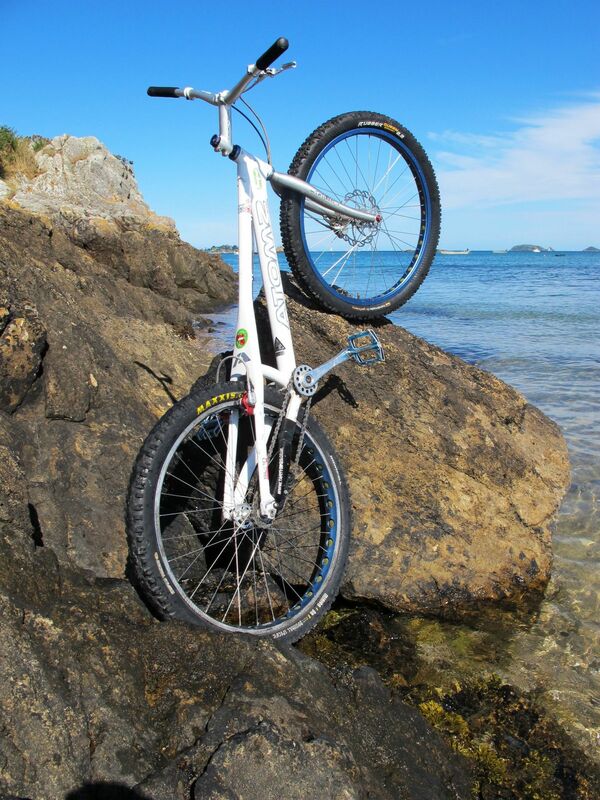 There are relatively few manufacturers of 24" trials bikes (you usually find this size of wheels on dirt or jump bikes fitted with a suspension fork). But there is a promising future with frame builders like Inspired Bicycles. The best way to decide is to try out different bikes... problem is... so far, you won't find these bikes in regular mountain bike shops. 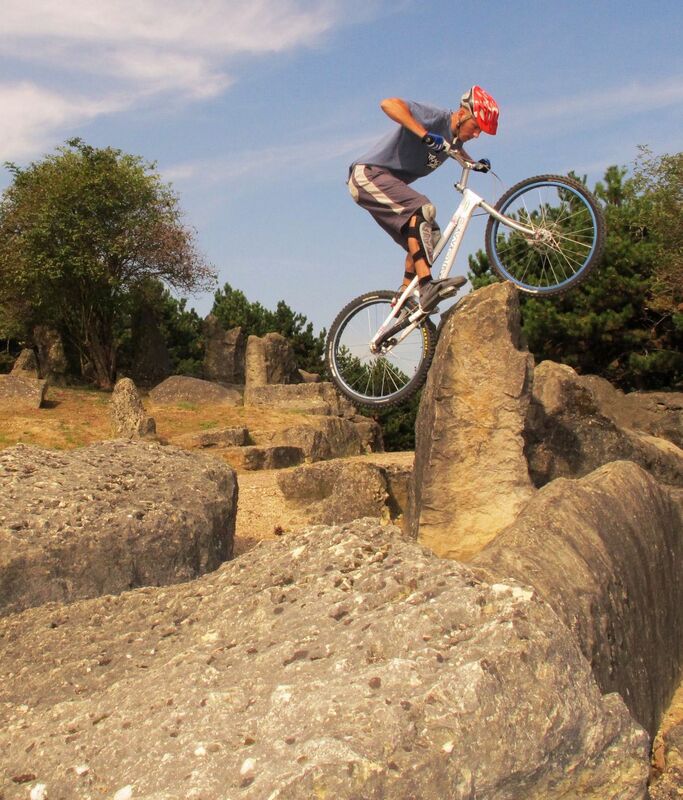 On the Trials Forum, find out if there are some local riders you can contact and meet up with. I only ride a 26" stock bike now because I started with the mountain bike I had at the time. I tried mods and they are really a lot of fun, but I still prefer my stock bike, because it feels more fluid and less quirky. As if it were not enough, you can choose from different geometries for both Mod and Stock bikes. Typically the longer geometries, with a wheel base from 1070 to 1100mm (the distance between the two wheel axis) make it easier to tap the front wheel onto obstacles, and to land on the front wheel. The shorter geometries (wheel base less than 1070mm) offer more spin, to turn around and pull out some street-moves... By changing the stem/handlebars combination, you can adjust your position on the bike to your exact liking. The chainstay length is also a critical specification, it ranges from 375mm (very short) to around 430mm for stock bikes. The shorter the chainstay, the easier it is to balance on the rear wheel. 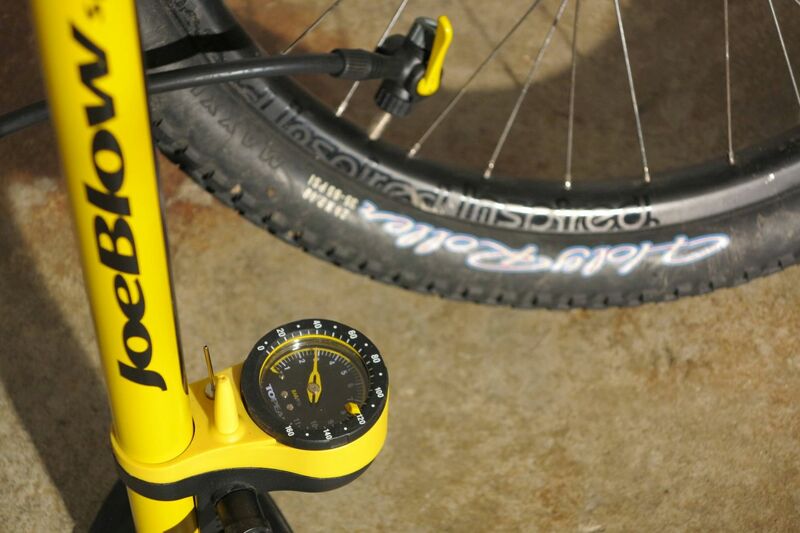 The Bottom Bracket height (above or below the weel base line) defines the feel of the bike. The modern and long geometries tend to have a high bottom bracket (varying from +15 up to +60mm on some frames). That gives more clearance for obstacles, but makes it more difficult to pull bunny-hops types of moves. You just get used to relying more on pedal-power techniques. 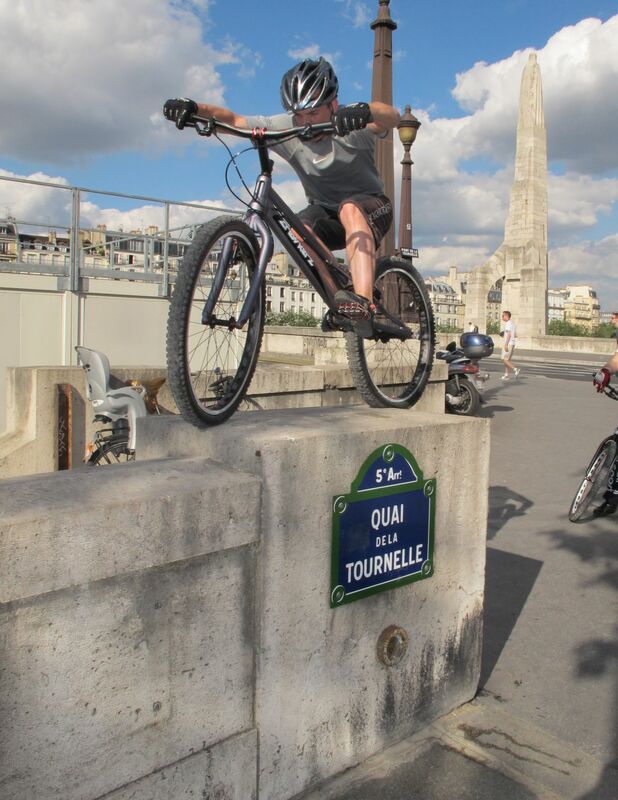 Once you balance on the rear wheel, the bikes feels the same, but you have a higher reach for sidehops (because your whole center of gravity is higher). What you need is plenty of room to move around the bike, to balance and to manoeuver. That summarises in a small frame, (usually the smallest available) and a combination of high rise stem and high rise wide handlebars. The length of the stem is determined by how much stretched you want to be on the bike. Wide handlebars give you more torque (strengtht) and more stability. 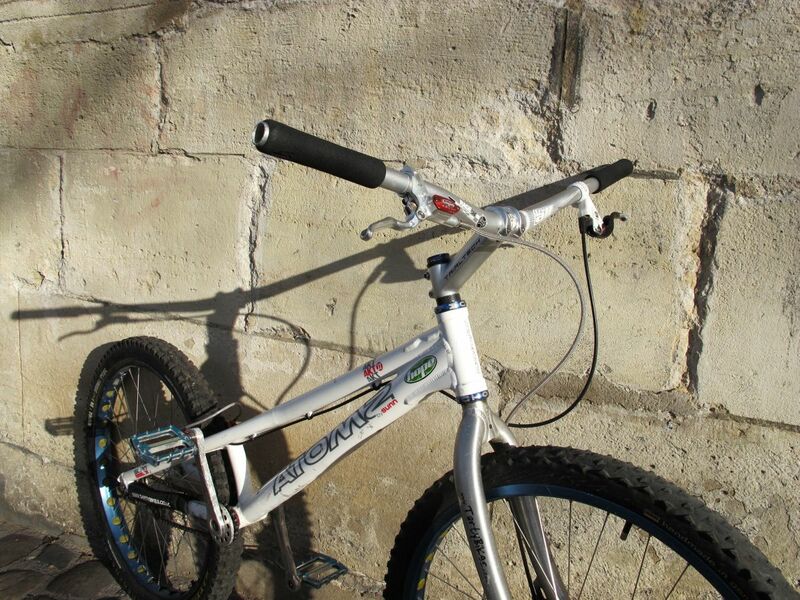 On a regular MTB, the seat should be adjusted to the lowest position. When riding trials, its not necessary to shift gears, and you can set the gear to a nearly 1:1 ratio (from crank to cassette). Typically ratio in the number of teeth are 22/19 or 20/17 for the front ring and rear sprocket. 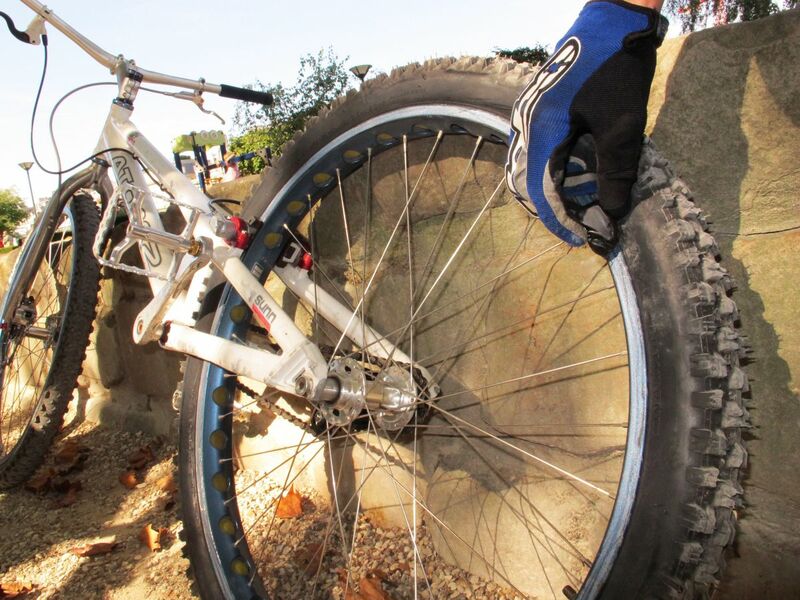 The tyres should be as big and fat as the frame spacing can take (up to 2.5" wide is common). If you have high-rise bars that sweep back, try them positioned at different angles. Leaning forward, the handlebars offer a lower riding position in favour of front wheel moves. Positioned upward, the bars bring the steering further back, making it easier to pull bunny hops and to lift the front wheel in general. Only a few millimetres will make a huge difference on how the bike rides, so take the time to experiment with the steering set up and discover what position works best for you. The length and rise of the stem will determine how much stretched you will be on the bike. 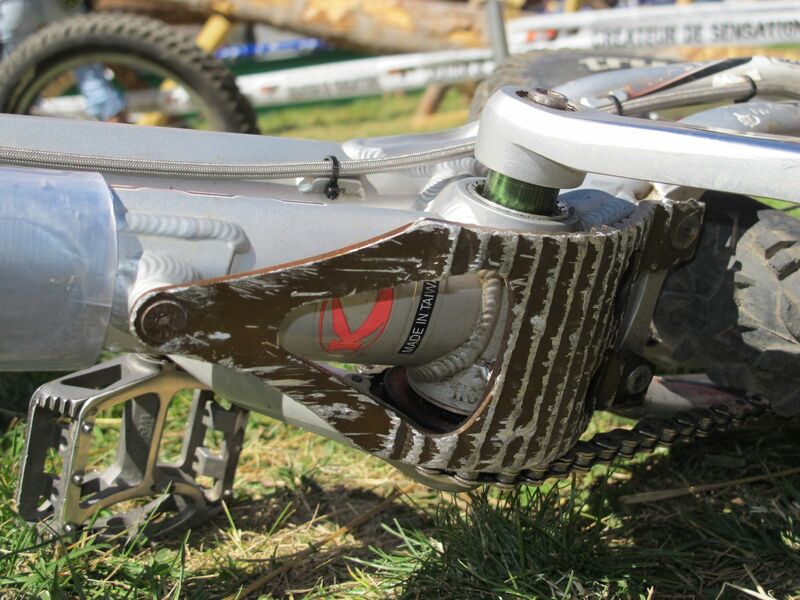 Changing the stem is probably one of the most effective ways to alter the feel of a bike. If the steering tube is not cut too short, you can also lift or lower the stem by displacing spacers above or below the stem. Wide handlebars give you more torque for the direction and more stability in trackstands. Slim bar grips and thin gloves will ensure a more direct touch and feel of the obstacles compared to thick grips. It is important that you feel with precision the asperities and texture on complex terrains, especially at the front wheel level. Brake levers should be positioned on the handlebars so that the tip of each lever is just about level with each index-finger when you hold the bars. That way, you can reach for the brakes using just the indexes, while maintaining a good grip on the bars. This will also prevent your other fingers from being accidentally trapped by the levers when you pull them to a full stop. The brakes should block the wheels to a full solid stop, with the pads pushing evenly flat against the rim flanges or the disc. Hydraulic rim brakes are powerful and very popular for the rear, especially on stock bikes where large wheels mean more torque and braking power (compared to disc brakes). If your frame doesn't have a built-in brake-booster, it is a good idea to fit one as this will prevent the frame seat stays from flexing (the frame elasticity decreases your braking performance). Disc brakes (cable or hydraulic driven) are the most popular on the front, offering excellent braking modulation and fine control especially for front wheel moves. They are more forgiving, mechanically since the fork doesn't flex under braking pressure. V-brakes are weak in comparison and require excessive finger pressure, at the expense of a good grip and putting you at risk of getting tendinitis. On most brake levers, you will find an adjustment barrel to pre-load the course of the brakes to your liking and compensate for pad wear. The hydraulic circuit doesn't require any maintenance, except if you accidentally burst the hose open (only then a special bleeding kit is necessary to refill the hydraulic circuit). Often, external brake boosters double as protection cover for the rear brake hose, preventing many accidental kicks. On a smooth rim, braking performance can be improved dramatically by rubbing a small block of tar on the flanges, but this won't work well in wet conditions. Most competing riders grind their rear rim to increase brake pad friction and braking performance in all conditions. This also wears the pads faster (and the rim at every fresh grind. Hydraulic rim brakes are lighter than disk brakes and less prone to accidental damage (a disk is easy to hit accidentally). Also, rim hydraulic brakes are lighter than disk brakes (mostly due to the disk), and the wheel won't suffer as much spoke flex as with a disk mounted on one side of the hub. Disk brakes offer a smoother braking experience, but they lack the hold of powerful rim brakes when landing on a sharp corner. The good thing about disk brakes is they are silent and don't squeal like rim brakes, they offer a very good performance even in the wet or in muddy conditions and there's no need to grind the rims. 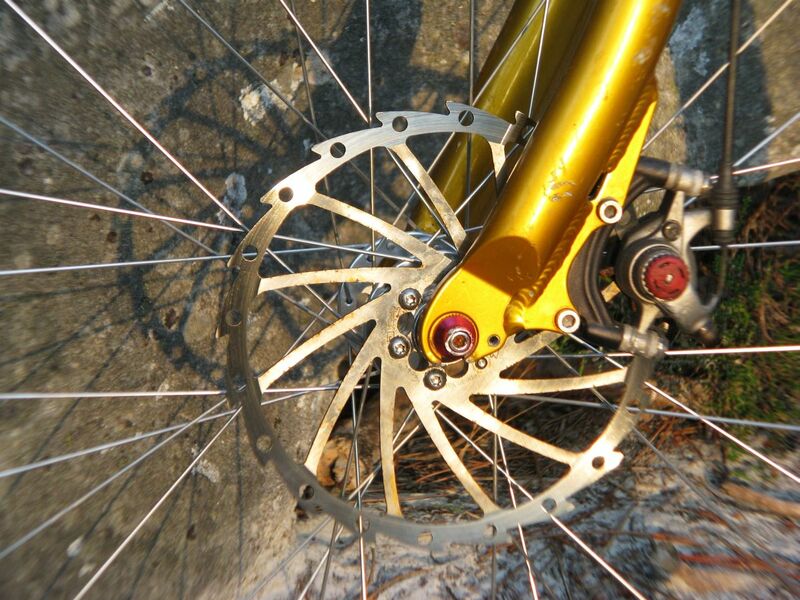 Often a good compromise is to run an hydraulic rim brake on the rear and a front disc brake. 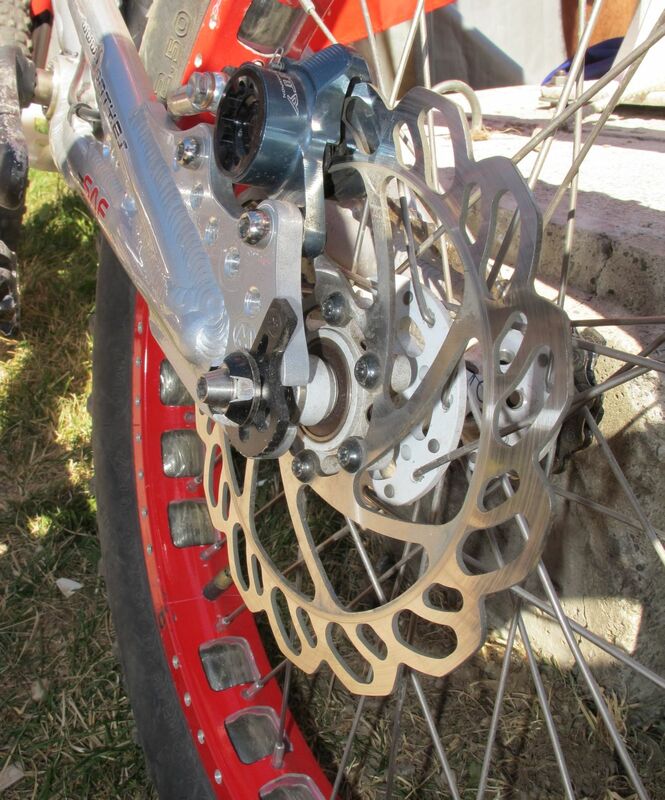 Another distinctive feature of all trials bikes is their very small and fixed gear ratio (defined as the number of teeth on the front ring or sprocket divided by the number of teeth on the rear sprocket). This ratio is usually set between 1 and 1.5 depending on the geometry and wheel size. A gear ratio of 1 means that for one turn of your cranks the rear wheel does one turn, whilst with a ratio of 1.3, the rear wheel would make 1.3 revolutions for one turn of the cranks (and thus cover more distance). At first, riding a trials bike feels odd, among other things because one has the impression of pedalling into thin air. In comparison, gear ratios commonly used on commuters' bikes range from 4 for the high gear (for example 44/11) to 1 for the lowest gears. A common set up for mod bikes is to have 18 teeth on the front and 12 teeth on the rear (18/12 ratio, that makes 1.5), while stock bikes tend to have a smaller ratio to compensate for the bigger wheel size and higher torque developed. In fact between 1.1 and 1.2 is the most common for a stock bike, 18 teeth on the front and 16 on the rear will give you a gear ratio of 1.125 (18/16). 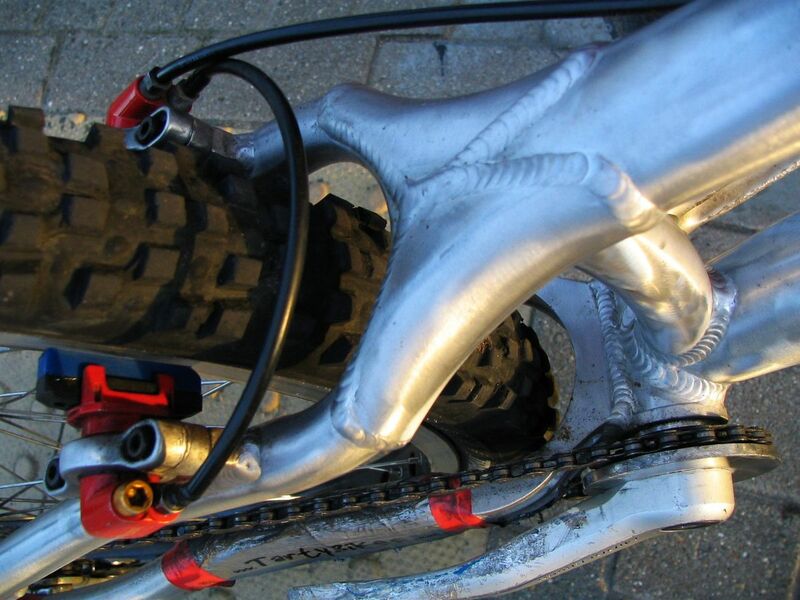 24-inch trials bikes tend to be fitted with a higher gear ratio (1.28 or 1.38). If you only use the granny ring on a normal crank (set for three chainrings), you can get rid of the larger rings and replace them with two cheap steel medium rings. Then you have the smallest chainring protected by two parallel medium rings that will also grip on most edges. In Trials, the gear shifters and rear derailleur are never used. It used to be that for competition purposes, you had to keep at least 6 working speeds. Then most riders changed the cassettes with the smallest lightest sprockets and only left a larger one to use. 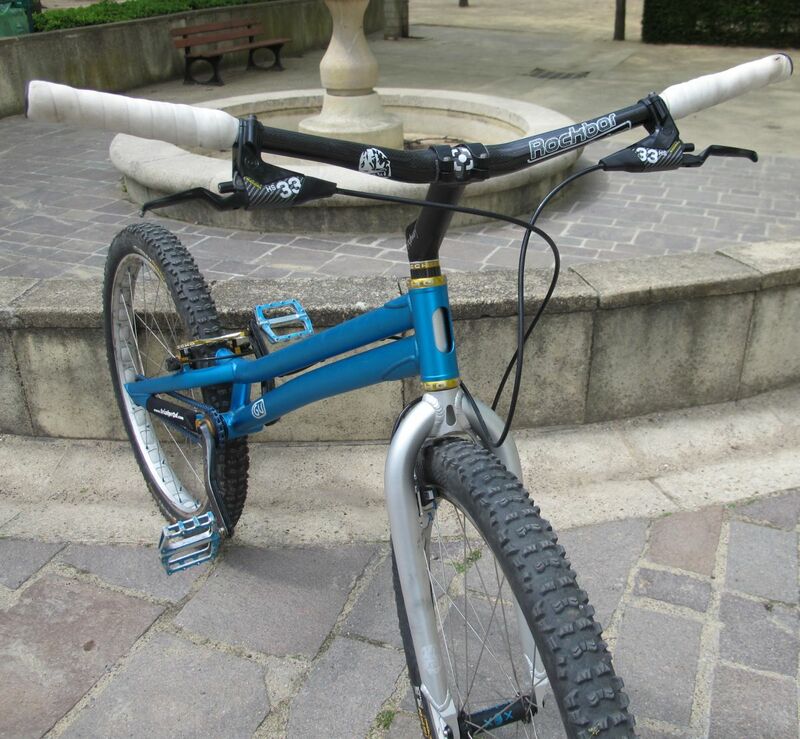 In 2007, the rules changed and allowed for single speed bikes with no gear shifters on the bars. 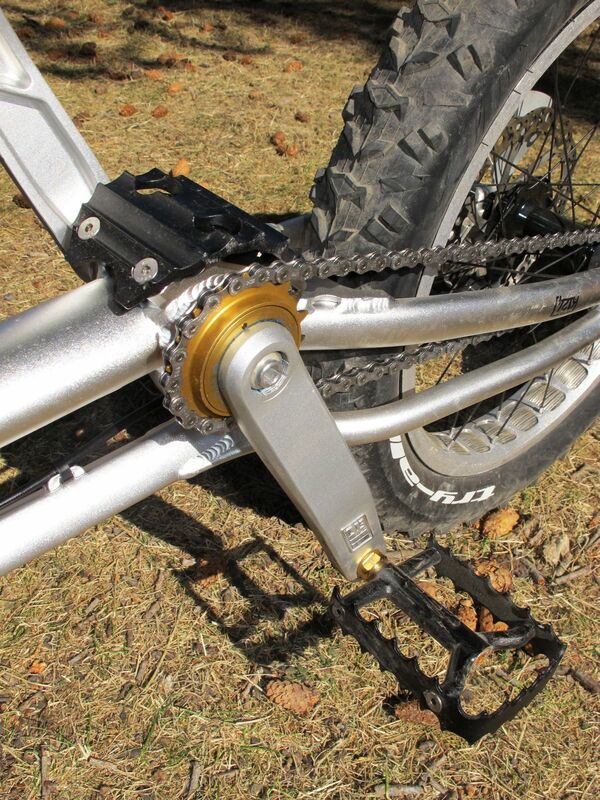 The frames require either a chain tensioner or an adjustable nut on a horizontal drop out for the rear wheel. First the brakes should block when pulled to the max. And if you have cables, pull to the max and make sure the cable is not on its way to break. Then the handlebars and the stem, pull on each sides, check there is no move, nor too bad creaking noises. 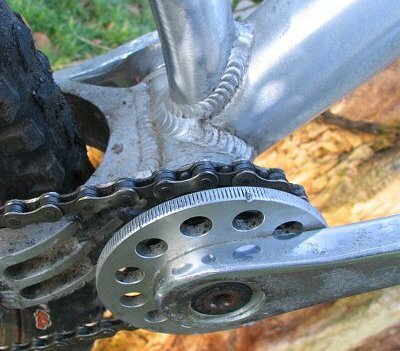 Then the crank, there should be no play in the bottom bracket, nor between the crank levers (if you have alloy levers and they round-off a little bit, you can adjust the play by inserting some small aluminium sheets 10x13mm cut out from a recyclable aluminium beverage can. 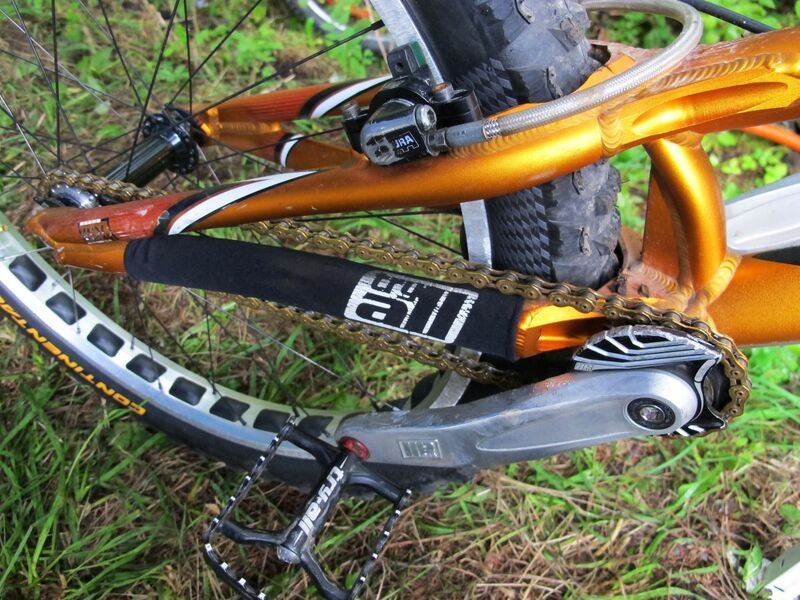 For the chain, it should run smoothly and fluid without bumps or jumps between the different gears. If two chain bits are not pivoting properly, use a chain tool to unlock the pin. Any part on a bike can break, but a frame or a back wheel wrecked into puree are still much safer than a bumpy chain that suddenly jumps or breaks when you kick in. 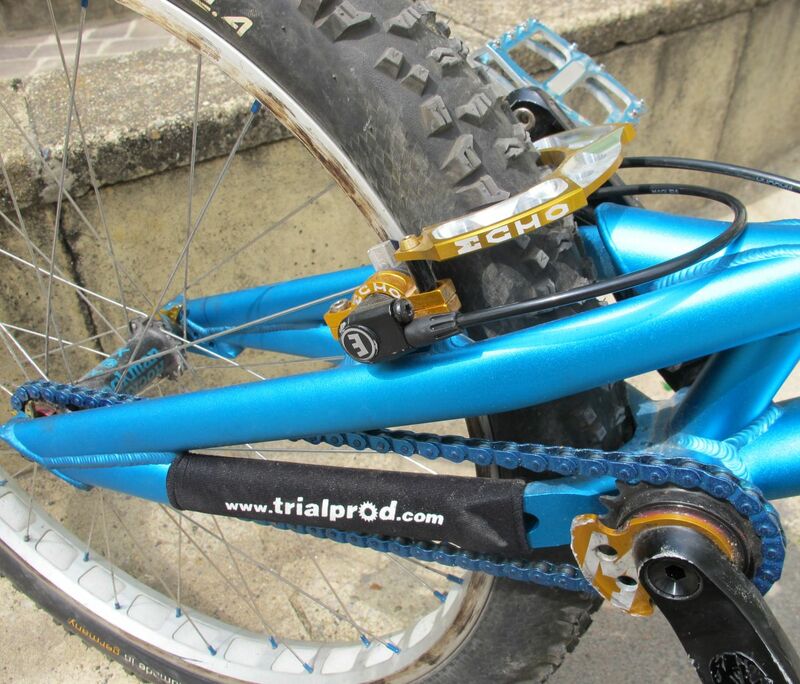 Why aren't clip pedals recommended for trials riding? Because Its way too dangerous to have your feet stuck when you need to jump off the bike at any time for a safe crash. You'd rather land on your feet than on your back, believe me. How to lift the bike in a bunny hop or back hop, or side hop? 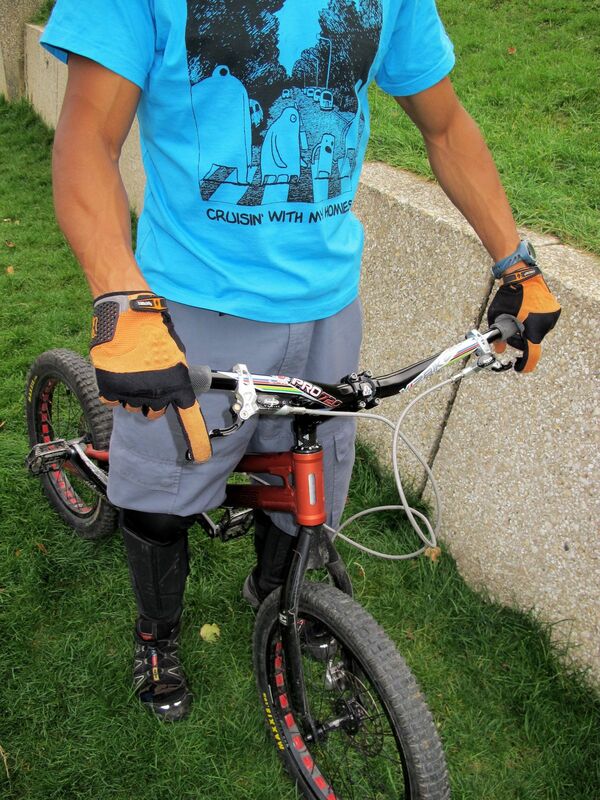 Lifting the handlebars is the only trick, because your feet can't lift the bike. It looks like the feet are stuck to the pedals, but in fact they are just limiting the ascension of the bike. The higher you lift the handlebars, and the faster you push them forward afterwards, with a forward twist of the wrists to force the whole frame to follow, the higher you can get the back wheel off the ground. Of course you need some synchronisation, this is the difficult bit that needs hell of practice. You can practice with full brakes on (the safest way to understand the move). That leads you to the back hop. For the impulse to jump, think about it like jumping on your feet without a bike. You need to flex the knees, then full extension. On the bike, same business but with synchronised pull on the bars upwards to lift the front wheel while still in extension. Once you are fully extended, it's time to lift your feet, like you do to jump over anything. As you are lifting the feet, you need to twist the handlebars forward and also apply back force on the pedals (its the only way the frame can follow, the entire bike rotates forward in a vertical plane). All the move takes less than a second. The lower the seat, the more margin you have to move around the bike.On certain moves (climbing or landing) you need to be very streched backwards on the bike, nearly seating on the rear wheel, and a high seat would punch you through the stomach (on mod trials bikes, there nearly no seat, just a flat cap mounted on the frame). Anyway, you never sit when riding trials, so the seat is more like a protection from the frame tubing. Most trials specific bikes don't even have a seat option. It depends on the ground and the sharpness of the edges you climb on. The sharper the edge, the more inflated you want the tyres so that you don't get a double pinch flat when banging the back wheel on it (the unfamous snake bite, rim rails pinching the tube against an edge). For round blunt obstacles like wood logs, less pressure gives extra gripping because the tyre can litteraly grab the edges and shapes. Less pressure also gives extra bouncing for landing, and is more comfortable. Fat tyres (2.5" or wider) are the best, and allow a lower pression than thin tyres, so more comfort and more grip. 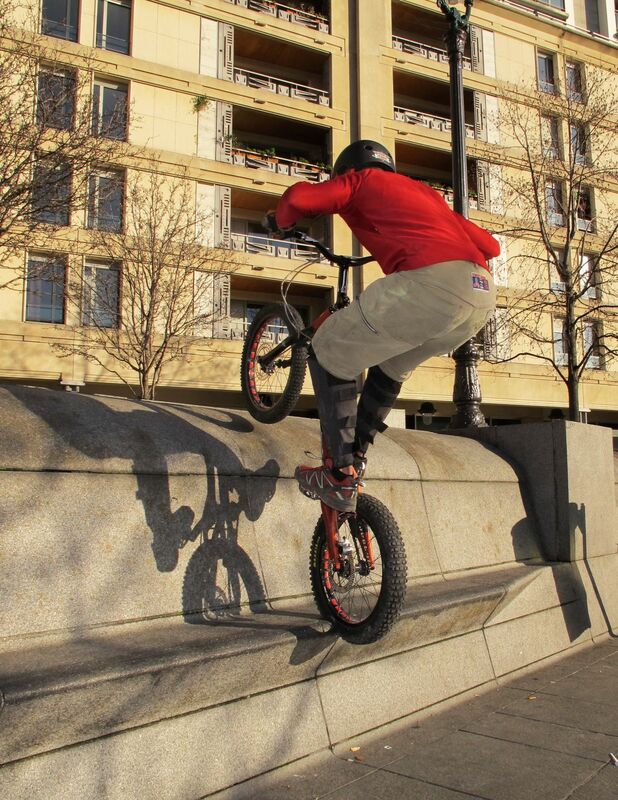 Riding street, you'll want much harder tyres than when riding natural. First because you don't want to pinch flat too easily when hitting square concrete edges at speed, but also for a more responsive and faster ride (less rolling friction). High pressure also makes it easier to spin around (over the rear or the front wheel) and will prevent the stick and twist effect that under-inflated tyres could yield. Typically, this translates into 3 bars/40psi or more for both wheels. The more pressure, the faster and sturdier the feel with more control on rolling lines (no drag, no squash), but put too much pressure and you could miss out on the bump-boost effect that most jumps and bunny hops rely on, when hitting a small step or a kicker ramp. Rock-solid high pressure will also be harsher on your wrists when landing flat, and you could be losing out on overall grip as the tyres won't "wrap" nicely over edges. In the end, finding a good compromise is down to personal preferences and experience, keeping your tyres rolling fast but with enough grip for precise stops. Ride very slowly upwards a very smooth slope, and go slower until the bike actually stops without the brakes. Then try to maintain the bike on the same spot by adjusting the pressure on the driving pedal (right foot most of the time). When you feel that you are loosing balance, kick in the pedal to carry on or twist the handlebars to get extra balance. The next step to understand balance better is to let the bike go backwards in the same slope, by decreasing the pressure in the pedals. This exercice is easier on a medium gear ratio. Why no suspensions in trials riding? Because its a drag. All the impulses you give to hop around tend to be absorbed by the suspensions, and the back wheel doesn't take off. 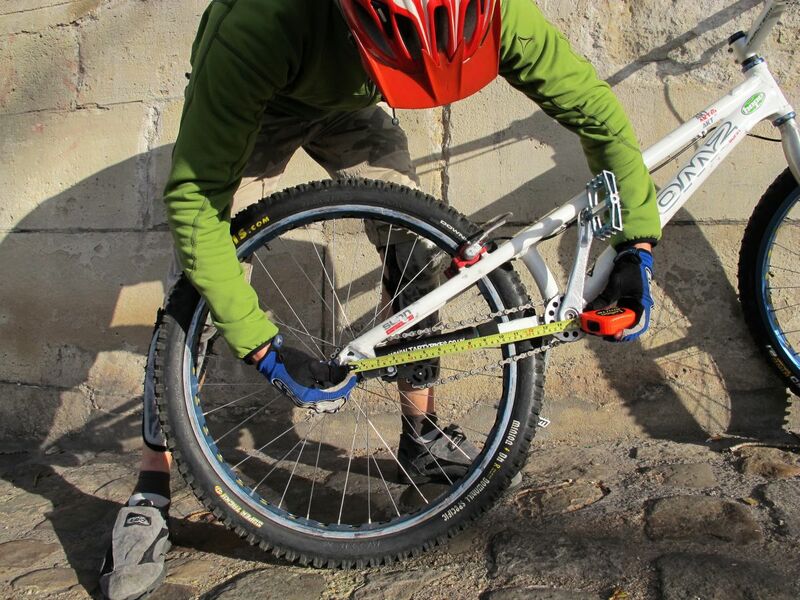 The suspension fork takes your energy on simple moves, and makes things more difficult to balance, because you have to compensate for the ongoing swinging of the fork. You can still do with a front suspension, tuned to the hardest setting. And its extra weight and money. 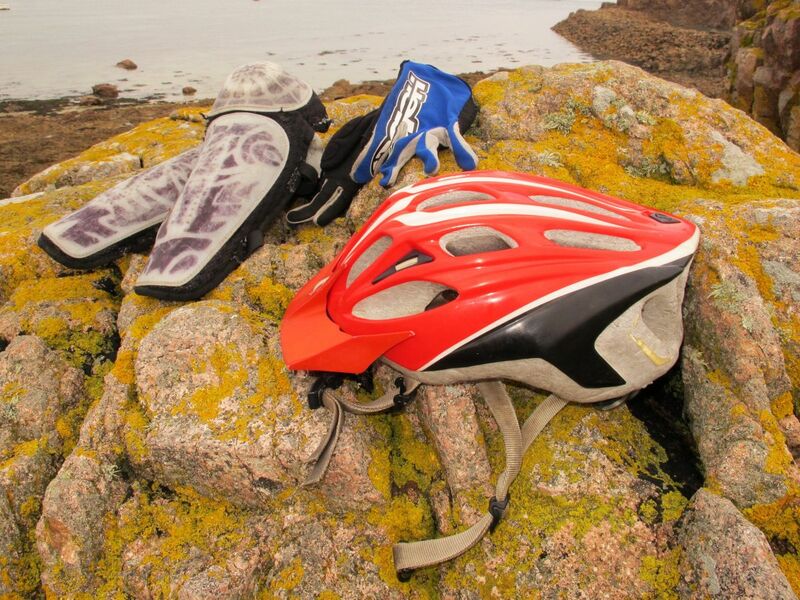 OK, the obvious one is the helmet, I know its boring, too hot, uncomfortable etc...but after a few crashs on your back (the most common in trials riding, due to bad timing with the rear brake), you'll realise how close your head can get to the rocks. Solid gloves, (the heavy braking involved wipes the skin out). And shin guards, to stop the pedals from grinding your tibias when you lose control. Always start small before you build the height. As a general fact, all the techniques described in that Website can be practiced from the edge of a 6 inches kerb, along your home street, until you are confident enough to try from higher. In trials riding, a zone is a guided track full of obstacles to climb on. To pass a zone, the rider must follow the tracks without putting the feet on the ground, otherwise he gets penalties. Send us an email for more tips.